Have you ever tried to take a nap on a log? Your friends are somewhere off in the woods, hunting morels. You have been hunting morels for days on end. 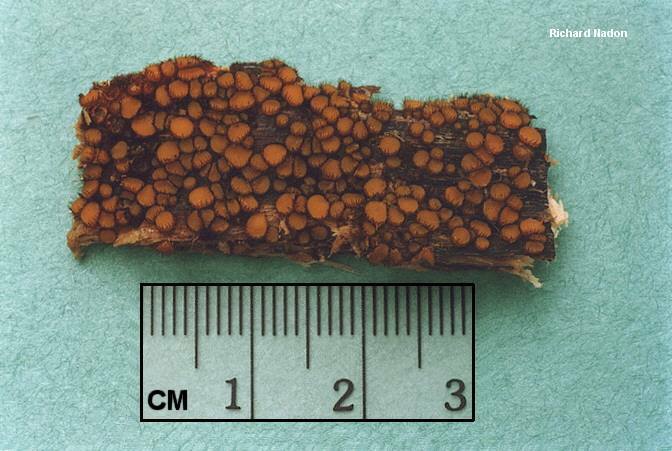 You have found more morels than you ever thought possible. You have found so many morels that, unbelievable as it may seem, you are bored with finding morels. You're miles from the car. Your feet are tired. Just curl up on this log, and take a nice nap. You doze for a few moments, then suddenly wake up and find you have turned your head: your nose now rests squarely in a knot-hole. The knot-hole is filled with decay and dirt--and a bunch of tiny orange things with ants crawling on them. 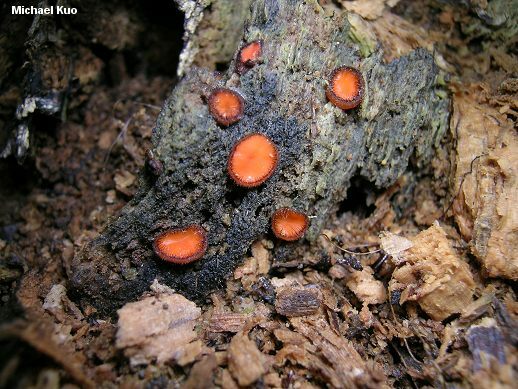 I probably never would have found Scutellinia scutellata that first time if Nature hadn't shoved it up my nose. The "eyelash cup" is very, very small--and if you click the illustrations for the enlargements, you'll see how it got its common name. 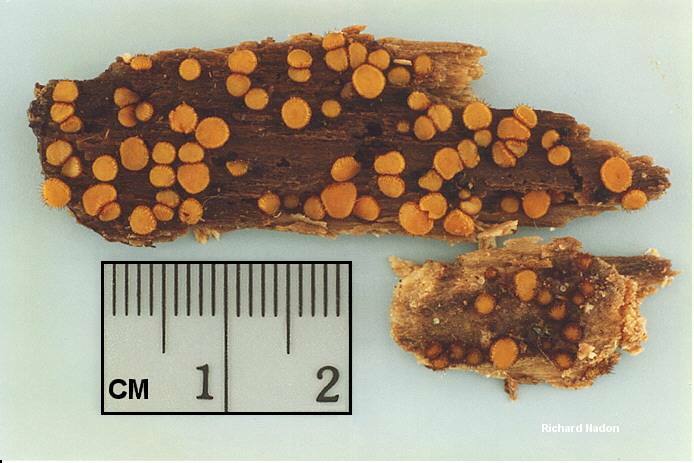 Among the many species of Scutellinia, Scutellinia scutellata is separated on its fairly large size (for a Scutellinia) and on the micromorphology of its spores and hairs (see the details below). 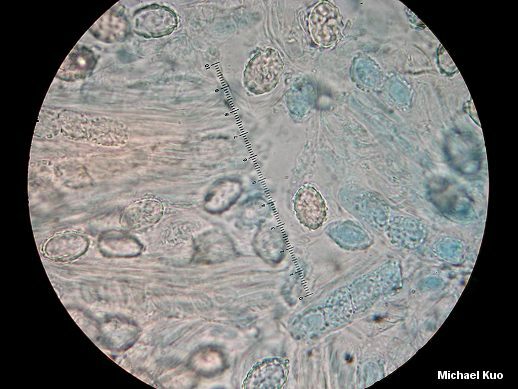 Ecology: Saprobic on wet, rotted wood, or on damp soil nearby; growing gregariously or in clusters; spring through fall; widely distributed in North America. 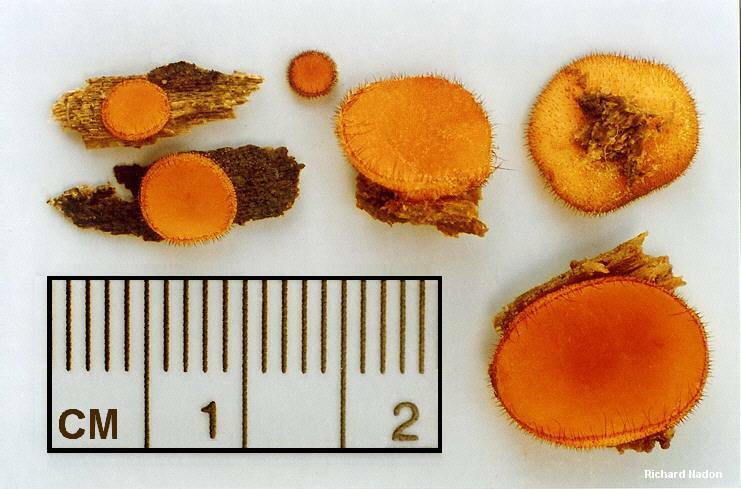 Fruiting Body: Cup shaped to broadly cup shaped, minute to 1.5 cm across; fertile surface ("top" or "inner" surface) scarlet red to bright orange, smooth; sterile surface ("under" or "outer" surface) brownish or pale orangish, covered with tiny dark hairs; the margin with longer, eyelash-like, dark hairs; without a stem; flesh thin and insubstantial. 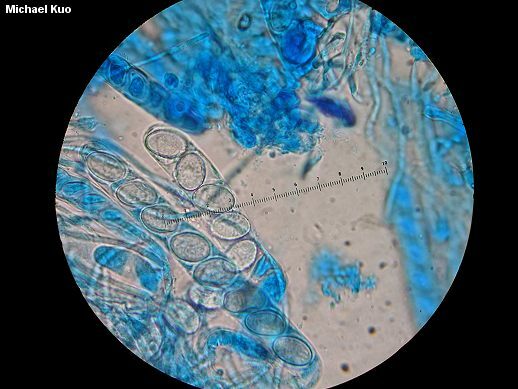 Microscopic Features: Spores (best viewed in lactophenol and cotton blue) 17-23 x 10.5-14 µ elliptical; smooth when immature, and remaining so for a long time--but in maturity prominently sculpted with warts and ribs extending to about 1 µ high; with several oil droplets. 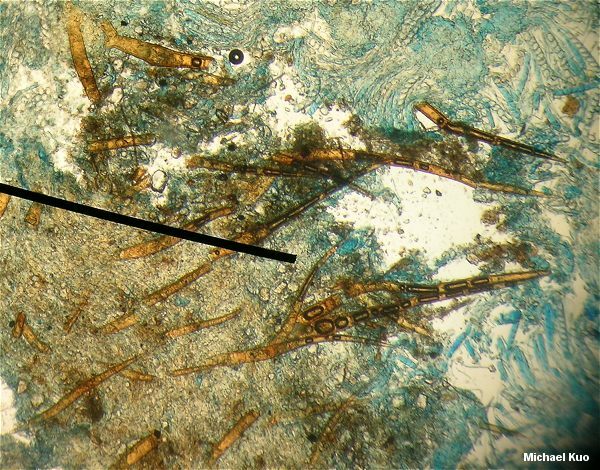 Paraphyses with swollen tips 6-10 µ across. 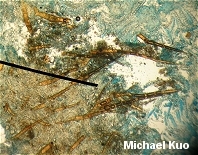 Marginal hairs (the "eyelashes") 360-1600 x 20-50 µ; brownish in KOH; thick-walled; multi-septate; with branched bases. REFERENCES: (Linnaeus, 1753) Lambotte, 1887. (Fries, 1822; Saccardo, 1889; Seaver, 1928; Denison, 1959; Smith, Smith & Weber, 1981; Arora, 1986; Schumacher, 1990; States, 1990; Phillips, 1991/2005; Lincoff, 1992; Metzler & Metzler, 1992; Horn, Kay & Abel, 1993; Yao & Spooner, 1996; Evenson, 1997; Barron, 1999; Roody, 2003; McNeil, 2006; Miller & Miller, 2006.) Herb. Kuo 05210301, 07100301, 07220310, 05060606, 06280801. 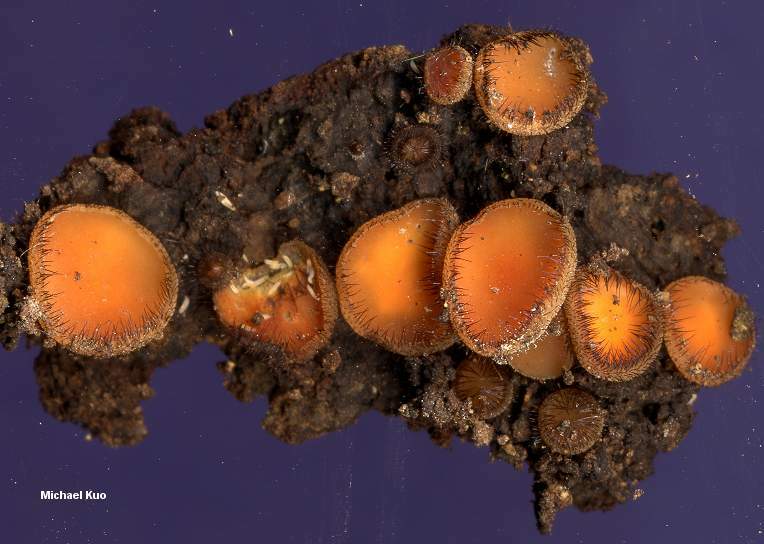 Also known as "Scutellinia erinaceus," Scutellinia setosa is even smaller than Scutellinia scutellata, with a maximum width of 3 mm; it often features a less brightly colored upper surface (usually a dull orange or yellow); and its spores, when mature, are smooth.